Synopsis : Results reveal food dialogue has gained momentum, with factors including health status, gender, income, education, and age influencing the food we eat. 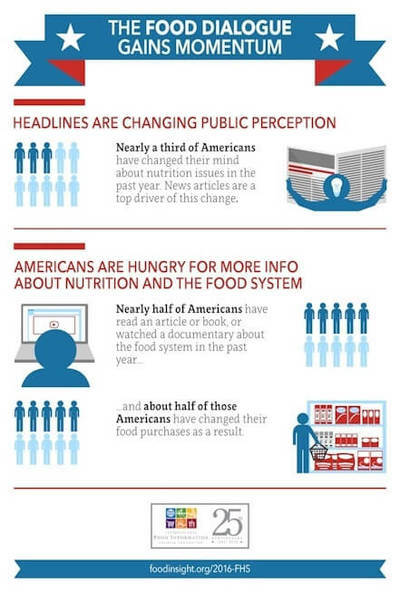 Americans are hungry for more information about their food, and the media are standing by with the spoon. In the last year, significant numbers of Americans have changed their minds or behaviors around food and nutrition issues, and the media are a top driver of those changes, according to the International Food Information Council (IFIC) Foundation's 2016 Food and Health Survey, "Food Decision 2016: The Impact of a Growing National Food Dialogue." "2016 is a big decision-making year for Americans," said IFIC Foundation President Kimberly Reed. "Not only do we have an upcoming presidential election involving more conversations with new voters, emerging technologies, and changing demographics, we also see more factors influencing Americans' food decisions. "Our 11th annual survey shows that the food dialogue has gained momentum over the past year, with factors including health status, gender, income, education, and age influencing Americans' views on the food they eat." The survey asked whether Americans' opinions had changed about a number of dietary components. An average of 31 percent changed their minds about at least one of them, for better or worse. In most cases, media headlines and articles were at or near the top of the sources that altered consumers' opinions. Americans also want to know more about their food and are changing their behaviors based on what they learn. According to the survey, 44 percent read a book or article, or watched a movie or documentary, examining the food system and/or commonly held beliefs about diet. About one-quarter of Americans either changed their food purchasing decisions (26 percent) or engaged with friends, family, or coworkers (23 percent) based on what they read or viewed. Health Survey Infographic - Image Credit: International Food Information Council Foundation 2016 Food and Health Survey. This year, 47 percent of Americans said they look at the ingredients list on foods or beverage packages when deciding what to purchase, up from 40 percent in 2015. When Americans define what makes a food healthy, it's becoming more about what isn't in a food rather than what is in it. Thirty-five percent of Americans define a "healthy" food as one that does not contain (or has low levels) of certain components such as fat and sugar, the top response when asked in an open-ended question. When given a list of attributes that describe a "healthy eating style," 51 percent of consumers chose "the right mix of different foods," followed by "limited or no artificial ingredients or preservatives" (41 percent). However, it should be noted that just 2 percent of consumers identified limited or no artificial ingredients or preservatives as a top consideration when not given a list. "Moderation/serving size and portions" topped the open-ended responses (26 percent) for healthy eating styles, followed by "includes certain foods I define as healthy" (25 percent). The definitions of healthy and natural foods are also being conflated. According to the survey, "natural" food is most often associated with having no preservatives or additives (29 percent of respondents), having ingredients that come straight from nature and whole foods (19 percent), or having no artificial ingredients or flavors (17 percent). According to the survey, 57 percent of Americans are trying to lose weight, with 23 percent trying to lose up to 10 pounds and 34 percent trying to lose 10 or more pounds, and they are making small changes to do so. Seventy-eight percent of Americans said they were likely to be more active throughout the day to help with their weight management, and 72 percent would spend more time exercising. One-quarter of Americans have changed their diets in the past year, most notably by eating more fruits and vegetables, making "small changes," and drinking water or low - and no-calorie beverages-although those who were already in better health were more likely to report positive changes than other respondents. If food is grown regionally or served at a local establishment, consumers are more likely to trust the safety of that food. More than 70 percent of consumers trust the safety of food produced in their region of the country, while just 24 percent trust the safety of food from another country. Consumers were also more likely (55 percent vs. 49 percent) to trust the safety of food from a local restaurant than the safety of food from a national chain restaurant. "For the past 11 years, the IFIC Foundation's has provided some of the most wide-ranging and compelling insights and trends about Americans' attitudes and behaviors around food, health, and nutrition," said Kimberly Reed, president of the IFIC Foundation. Similar to previous years, 57 percent describe themselves as being in very good or excellent health. However, those views are often at odds with health status as judged by Body Mass Index (BMI). Out of those describing themselves as being in very good health, 51 percent are actually overweight and 33 percent are obese. Of those describing themselves in excellent health, 11 percent are overweight and 6 percent are obese. Regardless of where Americans might actually be getting their information the most trusted sources for information about what types of food to eat were Registered Dietitian/Nutritionists (70 percent), "your personal healthcare professional" (65 percent), and U.S. government agencies (37 percent). The same three groups topped the list of trusted sources for information about food safety, with RDNs trusted by 70 percent, followed by one's personal healthcare professional (57 percent), and U.S. government agencies (52 percent). The 52 percent who trust the U.S. government for food safety information is a sharp increase over the 42 percent who gave the same response in 2015. One-third of Americans (33 percent) on an average day report spending 15 minutes or less eating dinner, while 54 percent spend between 15 and 30 minutes, and 13 percent spend 30 minutes or more. Thirty-seven percent report limiting or avoiding packaged foods, with about one-third of those people citing artificial ingredients or preservatives (32 percent) or extra sugar, fat and salt (31 percent) as reasons why. Ninety-four percent of adults say they consume caffeine, with 69 percent of them saying they know the amount of caffeine they consume-up from 64 percent in 2015. The number of Americans whose food and beverage purchasing decisions are impacted by sustainability increased significantly (41 percent in 2016 vs. 35 percent in 2015), although it continues to trail taste (84 percent), price (71 percent), healthfulness (64 percent), and convenience (52 percent) as purchase drivers. Seventy percent see modern agriculture as playing at least a small role in ensuring that all people have access to healthy food. A majority of Americans believe that modern agriculture produces nutritious foods (56 percent), safe foods (53 percent), and high-quality foods (51 percent). Seventy-three percent think it's important that food products be produced in a sustainable way. Of those 73 percent, the most important aspects of sustainability cited were conserving the natural habitat (44 percent), reducing the amount of pesticides used to produce food (43 percent), and ensuring an affordable food supply (37 percent). However, just 38 percent of all Americans are willing to pay more for food that is produced sustainably. On the issue of food waste, 58 percent say they're trying to limit it by taking leftovers home from restaurants, 53 percent use leftovers for cooking, and 51 percent plan their meals or make shopping lists. Contributors to food waste include forgetting about perishables until it's too late (19 percent), purchasing too much fresh or perishable food (17 percent), and cooking big meals but throwing some of it away (8 percent). The survey was conducted by Greenwald & Associates, using ResearchNow's consumer panel.